Last Saturday, I attended a meeting of narrow gauge modelers for the first time since November 2017. The primary activity of the day was to participate in an operating session on Tom Sullivan's Sheepscot & Sandy River. But everyone was supposed to bring a modeling project to show the group. I brought a rendering of the track plan for my revised Piedmont - Standard layout. I assumed I had preconceived notions about what I was planning to do that were blinding me to possibilities that didn't fit those preconceptions. Someone else might bring those possibilities to my attention. The layout should be visually and operationally recognizable as being based on a real place, but objective verification of whether I was on the right track has to come from someone else. Having started this layout long ago, it is difficult to see beyond old conclusions I have drawn regarding what will work and how things have to be. Prototype information is the best basis for discussing preliminary layout plans with someone else because it puts everyone on the same page. We discussed the prototype workflow involved in quarrying soapstone for dimensional stone and for talc production. All the production elements represented to scale would not fit on this or even a much larger layout. Opinions of informed peers help determine what really needs to be included. Running trains on Tom's layout was a great way to end a long dry spell. I came away from the experience with renewed friendships and some good ideas for my layout design. As illustrated in my recent Construction posts, I am removing the Piedmont and the Winwood sections of my layout. Doing something like that never occurred to me until I was spending hours in my shop working on the Railroad Display for the Quarry Gardens at Schuyler. 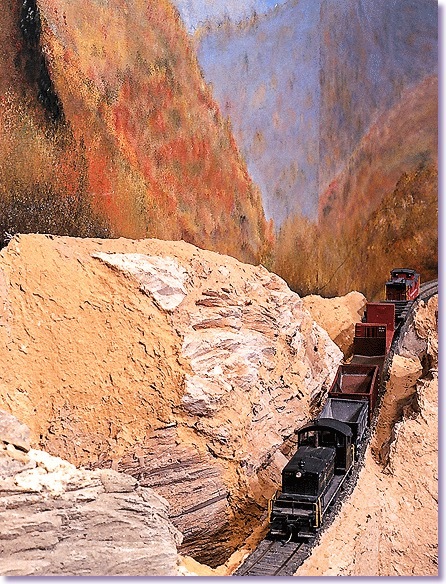 During that time, my attitude toward my shop in general and home layout in particular started to shift, and I became less interested in operating the layout and more interested in building a series of detailed scenes connected by a railroad. I started thinking that operating dioramas - a series of linked scenes built as if they were static displays - was really the most respectable approach to building the layout and was the way I would be happiest with it. The revised plan shows the main mill with standard gauge sidings is to the left as you come in the door. These standard gauge sidings are the Piedmont & East Blue Ridge Railroad. They run off stage from the Mill up Cobblers Creek to the connection with the Outside Railroad. In reality they stop under an overhead traveling crane at the layout room wall in a narrow alley between two buildings. There will be a mirror under the crane. The balance of the layout is the narrow gauge tram that the Piedmont - Standard Stone Company uses to move stone and talc. Unlike before, the narrow gauge handles almost no “front end,” or finished product traffic. Now it is primarily “back end,” or raw material hauling. The only exception being a few narrow gauge boxcars routinely get loaded with bags of talc at the Dust Mill to be transferred to the standard gauge. Before, my layout was like a narrow gauge version of the Nelson & Albemarle Railroad. Now, it is a more “typical” quarry operation. The layout used to run into the shop and office for operational reasons. As my interest in operation cooled, I considered how I could remove those two sections and still have a nice layout in a nice space. Fortunately, I only have to make a few track revisions and no benchwork revisions in the layout room in order to pursue this new idea. with folks who worked for Alberene Soapstone. interesting industry and its rail operations. Tom called today. Only because he blew out his back working on his house can he sit still long enough to talk. I come away from the conversation with the kernel of a distinction - why change scales and model in On30? 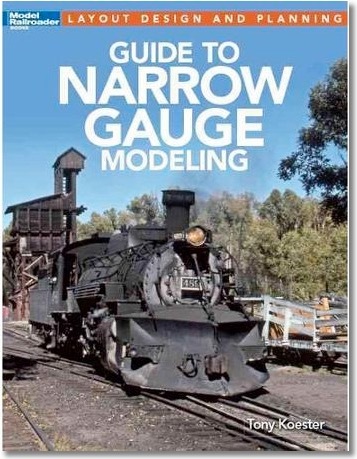 • I have no experience modeling in O scale, but it is 1:48, and that is easy to "think in." Figuring how big something would be in O scale is like making change. O scale lends itself to model building. • On30 is narrow gauge, without being a gauge that was ever popular in the United States. It is not exactly 2 foot or 3 foot gauge. And so, from a prototypical standpoint, it lends itself to freelancing. "Not exactly" is what On30 is all about. As soon as thought is given to representing a rail system in an enclosed, reasonably sized space, huge compromises have to be made. How much "imagination" am I comfortable with? When I look at my trackplan with On30 in mind, it is difficult for me to come to terms with the fact that the plan can stay basically the same while the layout essentially represents an area one fourth the size. Does it become necessary to change themes due to the fact that it is so obvious that the area being modeled is small? - Out and back from staging, as a branchline, shortline, or local. Considering the setting and the arrangement of the main characteristics of the plan, I see how the layout could be based on the Bergoo & Western Railroad, which is a shortline operating the old West Virginia Midland track in Webster County. The Western Maryland enters from staging, swaps cars at the passing track, and returns to staging. The local railroad would then work the coal loader, the sawmill, and the smaller coal loader in the office area of the layout. This is very similar to the way things are on the old West Virginia Midland in Webster County from Bergoo on down to Curtin and into Webster Springs. Good - It is prototypical, and suits the region and era. Bad - exploring other operational possibilities becomes less of a priority. And the Ideal shifts from simplicity to representation. The inspiration and reference can be there, but it is best to not suggest that the layout is duplicating a specific place. Room on peninsula for high, curved bridge based on Cheat Junction. Secondary Industry - possibly a small coal loader based on the one I photographed at Quinwood. Long curving siding could be based on Spruce. The primary industry could be a sawmill, based on sawmills at Swandale or Schulls Mills. Secondary Industry in office - small town, possibly based on Lansing, Webster Springs, Dilwyn, or Robertsdale.